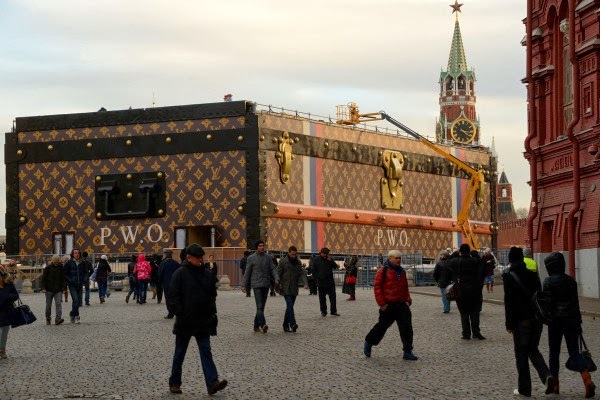 It is probably the largest Louis Vuitton trunk ever made. Well, it's not really a trunk. It's an exhibition hall resembling the form of a trunk. This ginormous Louis Vuitton trunk-styled building was erected to commemorate the the legendary adventurers and travellers. The exhibition, titled 'L'Ame du Viyage' (The Soul of Travel), will punctuate renown travellers that led them to posessing Louis Vuitton infamous trunk, including Pierre de Brazza Savorgnan, SOfia Coppola, Isadora Duncan, the Empress Eugenie, Greta Garbo, Catherine Deneuve, Ernest Hemingway (with his book trunk, which is on my top ten 'must-have' list), Karen Blixen, and Zaha Hadid. It is the trunk of Russian Prince Vladimir Orlov, whose initial immortalised on that trunk, that was replicated to build this "Red Square Trunk". In more than a century, Louis Vuitton has become the leading actor in luxury travel appliances. The trunk, in spite of its weight and difficulties to carry by self, is undoubtedly a significant part of history of travel and adventure. With Louis Vuitton made-to-order service, one can order trunk in any size and for whatever function it is, from teddy bear trunk to books, from flowers container to watches, with his initial or desired logo printed on it (I heard that they make exception only for two things, coffin and gun case). The exhibition opens from December 2, 2013 until January 19, 2014. Louis Vuitton also has launched an app (every one make apps for everything nowadays) for iPad, here.